To keep up with public requests for street sweeping, the city of Overland Park, Kansas created a website showing the sweeper schedule and which neighborhoods operators have already cleaned. The city sweeps streets twice a year, in the spring and fall. It takes about three months for the four sweepers to cover all 1,900 lane miles of city roadway. OVERLAND PARK, Mo. 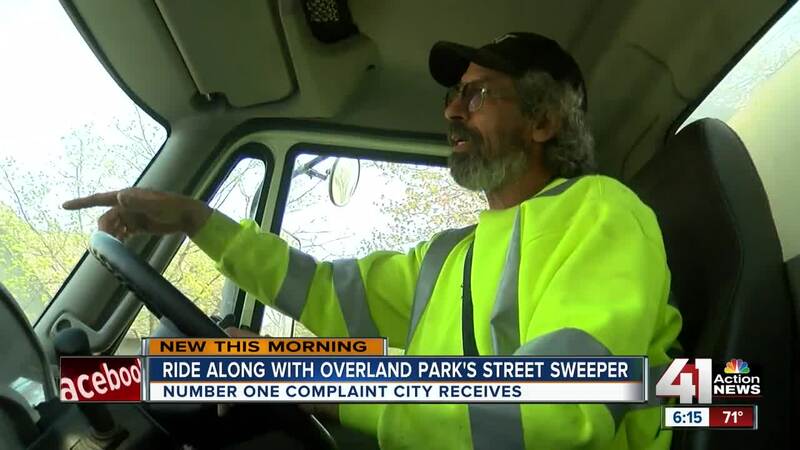 — To keep up with public requests for street sweeping, the city of Overland Park, Kansas created a website showing the sweeper schedule and which neighborhoods operators have already cleaned. The new website is available by clicking here. The city sweeps streets twice a year, in the spring and fall. It takes about three months for the four sweepers to cover all 1,900 lane miles of city roadway. “You get in your sweeper and you know you're accomplishing something. And the citizens, this is one of the things they pay attention to you doing. It's like snow plowing, they know when you've plowed their street. When you're running the street sweeper down the street, they know when we've been there,” said Chris Reese, a sweeper operator. The city cleans streets to prevent debris from going into storm drains and ultimately into the streams, creeks and rivers which the storm water system empties into. This winter, the city used sand to give drivers traction in snowy conditions. While the snow has melted, the sand has remained. The snow plows also chipped some pieces of pavement off the roads. A city spokesman asks drivers to respect street sweepers and reminds property owners not to dump yard waste on curbs expecting the street sweeper to collect it. The machines are not designed to collect that waste.